Because I can’t get this song out of my head lately, here is a music video from the 80s apropros of absolutely nothing. It’s Syd Straw, backed up by Michael Stipe of REM, singing “Future 40s (String of Pearls)”. My interview on Unanchor went live today and now everybody’s going to see my blog. Right when I’m in the middle of posting about my existential angst! I feel awful. I don’t know what’s wrong, exactly. It’s like a sudden, extremely intense depression. Everything aches. I move in slow motion. My face in the mirror horrifies me. I feel hostility from everyone around me in the real world, indifference from everyone online. Everything seems to make it worse. I don’t know what caused it; I’ve had depressive episodes but nothing that ever began so abruptly. I’m actually sitting here blaming myself for being so weak that I let this happen, though I don’t even know how it happened or why. I am still choking on film writing project. I’ve put it aside for now as it was overwhelming, but I still feel it gnawing away at me. For some reason I can still do paintings, and I am more productive at that than usual. It is one of the few things that don’t make my condition worse, though they don’t help in any way either. I finish them, they seem satisfactory to me, but I don’t feel good about them. I don’t feel good about anything. I don’t even want to write this, because it’s whiny. And now I’m angry at myself for being whiny. I haven’t jumped the rails of reality or anything. I’m not hallucinating or hearing voices. I am just suddenly overwhelmed by the meaninglessness of life. 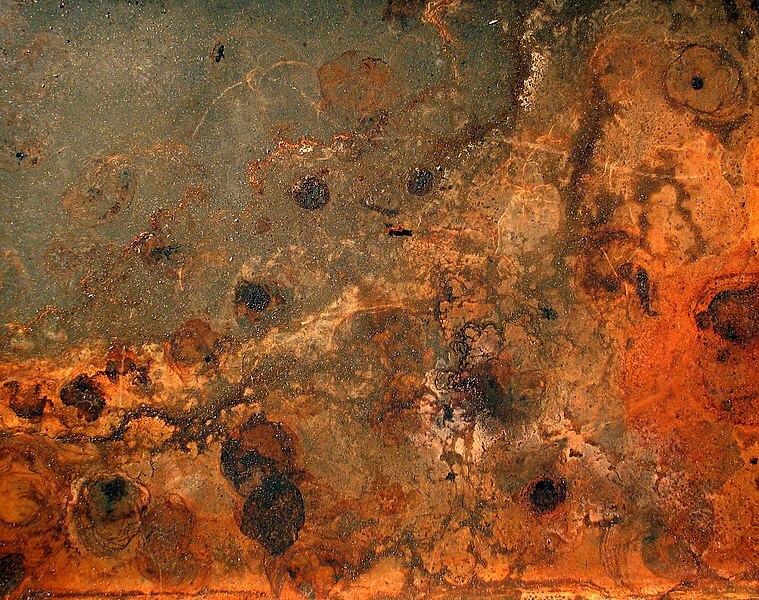 Corrosion is part of the natural process of decay. You can read more about how it happens here. Also, my twitter pal Patrick Baty writes a lovely and informative blog about historical paints, and he has an article about corrosion in bituminous finishes. It has pictures of unwrapped mummies! And old-timey paint bottles! Do check it out. A painting is a magic hat. I may put a rabbit in the hat, but someone might pull out a peacock or a platypus. What other people get out of it isn’t always the same as what I put in.